When this post was first published back in 2013, the idea of displaying your computer screen on your TV was relatively new. Since then, there's been a proliferation of digital and wireless technologies that allow you to easily take your office and conference room setup to the next level. So, I decided to revisit this topic to bring you the latest information on the technology available to you. For those who don't have the wiring to physically connect your computer to your TV, you’ll need an adapter to send the feed wirelessly. Fortunately, there are a number of reliable products available to help you get your meeting space up to speed. Below, I’ll review a few popular options to help you leverage wireless technology at your office and make the logistics of client presentations a breeze. Caveat: While you can stream on older TVs, you’re likely to have a better experience with newer-model, smart TVs. For more information on choosing the right TV for your office’s needs, review these 11 factors. Google Chromecast. One of the most popular ways to leverage wireless technology at your office is with Google’s Chromecast, a streaming device that supports 1080p resolution at a steady $35 price point. Chromecast now allows you to display your entire monitor, rather than just what’s in your Google Chrome window. 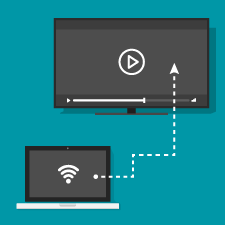 This added flexibility makes Chromecast an excellent option for displaying information on a TV during client meetings, as it allows you to dedicate an entire screen to the presentation while using a second monitor for information you wish to keep private. Microsoft WiDi. Microsoft offers a wireless display (WiDi) adapter, which is available for $49.95. The adapter is powered by Miracast, allowing you to display everything on your device on a TV or monitor. Miracast is now natively supported on all Windows 8 and 10 devices, making the Microsoft WiDi a great option for most PC-based offices. Microsoft has also started working on a new connectivity concept: Intel Unite, an all-encompassing conference room solution for businesses. Be on the lookout for a consumer version of Intel Unite coming soon! Apple TV. Apple TV has withstood the test of time as a reliable means of casting your screen, and it now provides better support for Siri and additional built-in apps. In typical Apple fashion, Apple TV has stayed at a higher price point of $149 for the fourth-generation version and $179 for the illustrious 4K resolution option. Apple TV is compatible with non-Apple products, but like most things Apple, it works infinitely better when used in a Mac environment. Apple has also introduced a Miracast-esque product known as AirPlay, but it’s exclusive to Apple devices. Roku Ultra. One of the most pleasant surprises over the years has been the further development of the Roku Streaming Stick. While initially seen as an alternative for cord cutters, Roku ended up producing one of the best screen-mirroring devices on the market. Roku Ultra is priced at $99.99 and provides 4K streaming. The one caveat is that Roku will only work with Android and Windows devices. Mac users can still use Roku Ultra for the built-in apps and other features, but they’ll be unable to cast their screens, making it a poor choice for client presentations if your office is Mac-dominated. No HDMI Port? No Problem. Join.me. It’s common for advisors to dedicate an entire PC to a conference room and control it via a wireless mouse/keyboard combo. If a wireless adapter is not a viable option, an advisor can simply bring his or her laptop into the conference room and host a join.me session using the conference room PC. Join.me, offered by LogMeIn, is primarily used for videoconferencing, but it can be easily configured for wireless display purposes in a pinch. It’s rich with features and allows the same kind of display control as you would get with Chromecast (such as selecting a specific monitor or window to present). The standard version of join.me is free, while professional versions with additional features, such as recording and annotating, are available for a monthly fee. No article about wireless devices would be complete without mentioning the wired option. While it’s an exciting time for wireless technology, there is still no substitute for a wired solution’s unparalleled reliability. The wireless options mentioned above are king when it comes to flexibility, but for advisors with the luxury of designing their own office spaces, displaying your computer screen on your TV via a physical connection is the most dependable option. If you have the opportunity, consider installing not just Ethernet ports into your wall outlets, but HDMI ones as well to help cut down on wire clutter. Design smart and reap the rewards! Do you leverage wireless technology at your office? What’s your preferred solution for displaying your computer screen on your TV? Please share your thoughts with us below! Editor’s Note: This post was originally published in December 2013, but we’ve updated it to bring you more relevant and timely information.